Support material is easy to break away, printed parts are tough and durable and look great with fine surface finish. Printed parts can be sanded, primed and painted with acrylic. Models can also be glued with superglue, acetone, epoxy or ABS cement. 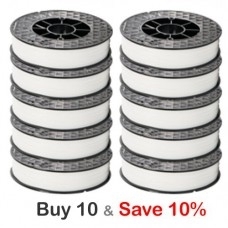 Two rolls of filament come packaged in a carton with vacuum packed spools with desiccant to keep the material dry. To print with this material in the UP software, select Maintenance / Add New Spool and choose "ABS"